Yoghurt, better known as “yogurt,” is a dairy product made from the bacterial fermentation of milk. Aside from its popular taste, texture and characteristic tanginess, yogurt has been found to have numerous beauty and health benefits. Here are seven healthy reasons why people should add yogurt to their diet. Yogurt eaters will get a dose of animal protein (about 9 grams per 6-ounce serving), plus several other nutrients found in dairy foods, like calcium, vitamin B-2, vitamin B-12, potassium, magnesium, and so on. While the vitamin content depends on the type of yogurt being consumed and the way it was produced, yogurt has been found to share a majority of the vitamins found in milk. No need for pricey derm treatments to perfect your complexion. You may not realize that yogurt is a gentle, inexpensive way to treat problem skin. Plain low-fat or whole-milk yogurt contains lactic acid, which softens the skin, reduces wrinkles and hydrates dry areas. For a DIY moisturizing face mask, mix two tablespoons plain yogurt with one tablespoon of honey and one to two tablespoons of cooked oatmeal. Spread it liberally on your face, arms or legs and rinse with warm water after 15 to 20 minutes. After removing the yogurt mask, apply a noncomedogenic lotion to lock in restored moisture. Yogurt is a good source of calcium and vitamin D, which are both necessary for maintaining healthy bones. Osteoporosis is a disease of the bones and increases the risk in a bone fracture. The combination of calcium and vitamin D found in yogurt makes it especially beneficial to those suffering from osteoporosis. Since not all yogurts contain the same amount of calcium and Vitamin D, it’s important to check the nutrition labels. A study found that consuming dairy products with the probiotic Lactobacillus gasseri, such as yogurt, can help reduce abdominal fat and promote weight loss. According to Dr. Michael Zemel, a nutrition professor who led the study, the calcium found in yogurt induces weight loss by triggering fat cells to create less cortisol, a hormone related to the accumulation of belly flab. In other words, the calcium intake from yogurt helps the body to burn body fat rather than store it. You have trillions of bacteria in your gut that help you digest food, and yogurt contains some types of these healthy bacteria, they have the ability to keep the digestive track in order and calm issues such as diarrhea, gas, cramps and even irritable bowel syndrome. 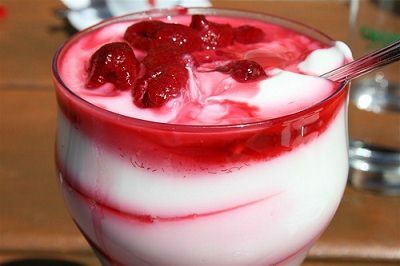 In a recent study, the regular consumption of low-fat yogurt has shown to help reduce the risk of high blood pressure. Every day 70 percent of us consume more than twice the recommended amount of salt; over time that can lead to hypertension and kidney and heart disease. The potassium in yogurt, almost 600 milligrams per eight ounces, may help flush some of the excess sodium out of your body. What this means is that blood pressure medication may be completely unnecessary for many people who simply revamp their diets to include foods like yogurt that appear to improve blood flow and ease arterial inflammation and other factors that can lead to high blood pressure. Studies have shown that eating yogurt with probiotics can increase the amount of T lymphocytes, which play an important role in the immune system and help fight off illness and infection.